For all of the leaf-peepers out there…whether you like to take it easy and drive the scenic byways or actually get out of the car and hike to see brilliant fall color, Eureka Springs is a fall foliage mecca. 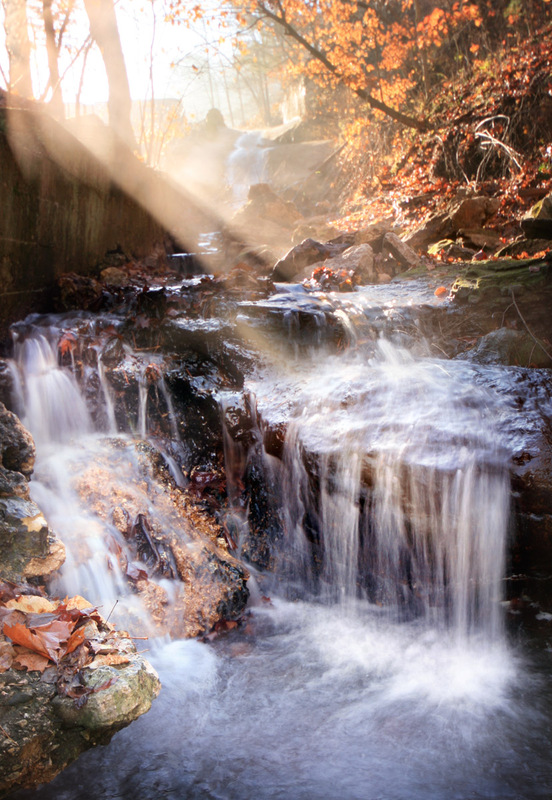 Light filters through fall leaves in Black Bass spillway. Winding roads open up to breathtaking vistas of the tree covered Ozark Mountains. Red blackgum and dogwood, yellow hickory, orange sassafras, purple sweetgum, and flaming maples orchestrate a symphony of color beginning in late September and October. Sunsets over Beaver Lake mimic autumnal colors in the water and colorful leaves travel rushingmountain streams. Here are some of the best and most colorful drives and hikes in the midwest. From the I-540 corridor in Northwest Arkansas follow 62 East to Eureka Springs. Watch the White River wind through the colorful valley at Inspiration Point overlook (right next door to Castle Antiques-see on google map). While in Eureka Springs, view the Victorian village from East Mountain Overlook. For a little side trip, take one of the most scenic drives to Beaver Town on Highway 187 where you can cross over the scenic White River on the Little Golden Gate Bridge (see on google map). Highway 187 will also take you to the Beaver Lake Dam, a perfect place to watch the sun set over the lake. If you are looking for a daytrip, drive to the Buffalo River National Park. Painted limestone bluffs frame America’s first National River. For those of you feeling mildly adventurous, there are several beautiful trails right in Eureka Springs. Walk the historic streets to see Victorian homes tucked into the foliage and visit the natural springs hidden in plain sight. Most are surrounded by jewel-like pocket parks and feature bouquets of colorful gourds created by local city gardener, Don E.
Floating leaves create ever changing art while walking around Black Bass Lake and abundant wildlife make regular appearances on the trails of Lake Leatherwood. If you are really adventurous you can hike in the Buffalo River National Park to picturesque places like Hemmed-in-Hollow, Hawksbill Craig, or view the waterfalls of Lost Valley. Learn more about Greater Eureka Springs Outdoor Adventures! Eureka Springs in the fall features more than just spectacular color. Soaring across Beaver Lake, majestic eagles search for food. You can’t help but feel patriotism when you see these magnificent birds in flight. Eagle viewing cruises depart from Rocky Branch Recreation Area or on Belle of the Ozarks and provide unparalleled views from the water. Find other things to do right now in Eureka Springs on the Official Eureka Springs Calendar of Events! Fall photographs were captured by local artist Edward Robison III. See more of his photos of Eureka on Sacred Earth Gallery’s website. Because Eureka Springs is a mecca for fall leaf viewing, accommodations go fast. Visit EurekaSprings.com to see the most comprehensive listing of lodging in the Greater Eureka Springs Region. Motels to mountaintop resorts, mountain cabins to Victorian Bed and Breakfast’s…you will find what you need. 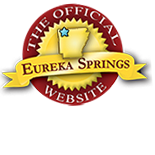 Follow EurekaSprings.com, the Official Website for the Greater Eureka Springs Region, on Facebook to see regular color updates, photos. Can’t be here for fall? Watch fall’s fantastic show…we will post photos every week as the colors change. Visit us and Fall in Love with Eureka Springs! This entry was posted on September 23, 2011 by estcblog in Fun Downtown, Road trips, The Great Outdoors, Things to Do and tagged Arkansas, beaver lake, Black Bass Lake, bridges, Buffalo National River, downtown, Eureka Springs, historic downtown, Lake Leatherwood, natural springs, Outdoor, white river.